Canyoneering occurs within a "commons" area – our public lands – that we all have an ownership interest in. We have a responsibility to each other to minimize our impacts on our shared resource, and leave it as close to how we found it as possible. Or perhaps, how we SHOULD have found it, as responsibility includes the obligation to clean up after less-socialized individuals before us. Some aspects of this discussion are best considered under the Ethics and Style section of this site. They overlap, but this article is more about interacting with other groups. Yes, leave no trace also applies to waste. Pack it In, Pack it Out: take your trash with you. 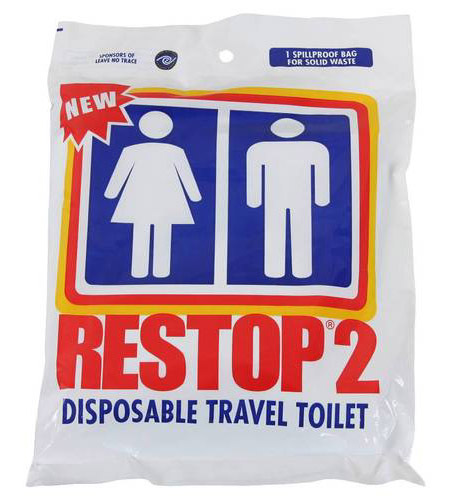 This includes your poop – provide each member of your party with a Restop2 poop bag and make sure they use it when appropriate. Carrying out other people's trash wins you bonus points. Be careful how you stow stuff, including trash, in your pack, so that it does not escape when you rappel to swim. Minimize anchor intrusion: use subdued-color webbing (black or grey), and leave a minimal amount. When anchors have multiple slings, cut off the excess and pack it out. Fixed ropes are not appropriate in the backcountry – remove them and pack them out. Rope Grooves are a form of human impact and artifact. Learn how to set up raps to minimize grooving. How you interact with other people you find in canyons has a significant impact on the quality of other people's trips. Be nice, be courteous. If you find yourself rubbing shoulders with another group, perhaps your group should take a break, have an early lunch, take a teaching moment – something to create separation between your groups. Some canyons are popular and can be crowded. If you find yourself queuing up for rappels, don't take it personally. Chill out. Recognize that the day will be more social than you had expected. Letting the passing group know you are setting up a pass, so they can take advantage of your courtesy. Finding a good place for the pass. Short rappels are especially good. Fix YOUR ropes on a rappel, for them to use. That way, they can efficiently rappel, then move forward while your group rappels, then pulls and stuffs the ropes. If catching up to a group who does not offer an opportunity to pass, request that they do. Many people are unaware that this is the etiquette in canyoneering. Beginner canyoneers may be upset by the very thought! Forcing a pass past an uncooperative group is usually a bad idea, in addition to being rude. At times, you will run into groups that are under-skilled for what they are doing. Sometimes they will even know it. Offer assistance if it is appropriate and can be done in a courteous manner. It's not just the technical canyons that get crowded - many hikes in popular destinations like Zion National Park become clogged with people during tourist season. I am not fond of large, poorly-managed groups in canyons. Unfortunately, it seems inexperienced persons tend to travel in large groups, with little understanding of how their actions impact others. What constitutes a large group varies by place and circumstance; but from a social point of view, any group that crowds others can be considered large. In Zion, groups larger than six are not allowed in most canyons, and perhaps we can consider that a good general rule of thumb: groups larger than six are discouraged. Break It Up. Take your group out in smaller groups of about 6. If you don't have enough competent leadership to break into groups, you don't have enough to manage the larger group either. Respect Your Fellow-Travelers. Large groups can be obnoxious to other groups. Play well with others by giving them ample space and keeping the raucous laughter and social chit-chat to a minimum. That touch-football game can probably wait until you are back at the campground. Carry Extra Gear. Given the carrying power of all those people, bring plenty of ropes so you can keep things moving along. Formally interact with other groups. When coming upon or being caught by other groups, the leader CAN make a formal contact with the other group and plan who is going to do what to minimize social impacts. In general, the large group is obligated to defer to the small group (for instance, by letting them pass at the first opportunity). We CAN all get along, especially if we make that an explicit personal and group goal.